Sick of your friend going on and on about how he grabbed his kitchen table at IKEA and found his sweet man bag at the mall? One-up him by saying you got the same things handmade by a Roycroft master artisan! That’ll teach him! On June 26 and 27, swing out to East Aurora for the Roycrofters at Large Summer Festival, where you’ll meet dozens of artisans from across the country selling furniture, pottery, paintings, leather goods and more. A Greek word used to describe a jubilant emotion of/during ‘celebration’. If your daughter is turning 13, the biggest thing you could do for her birthday would be to have Miley Cyrus perform. It would be awesome. You’d be the best parent ever. If you’re the University at Buffalo and you’re planning the 35th anniversary of your June in Buffalo new music festival, you’d schedule composition superstar Steve Reich to be there. And they did. Reich, Augusta Read Thomas and a handful of the most buzz-worthy composers and performers in the world will take part in concerts, master classes, open rehearsals, lectures, seminars and installations from May 31 to June 6. The inaugural National Garden Festival is coming to town this summer, and it’s an event like no other in the country. It’s a five week celebration (June 18 to July 25) of our garden walks, talks, tours and events. The Festival will be like a great, green umbrella under which garden tours, the Japanese Garden, the Erie Basin Marina Gardens, the Botanical Gardens, the Rose Garden, the Elmwood-Bidwell Farmer’s Market, the Olmsted Parks, Garden Walk Buffalo, garden symposia, and new special events will be presented to garden lovers, gardening enthusiasts and culturally inclined travelers who revel in the kind of tree lined streets, Victorian architecture and locally owned shops and restaurants that are found in abundance throughout out the Buffalo region. For more information, check out its new video and website, NationalGardenFestival.com. This weekend I am looking forward to attending one the coolest nights out in Buffalo. It’s a Multi Art & Music Party being held from 9pm – 2am. I’m also very intrigued of the location for this event. It will take place at Rock Harbor Yard 57 Tonawanda Street in Buffalo, just a few minutes from Buffalo State College and Elmwood Village. In the past 21 incarnations of Hallwalls’ Artists & Models Affair, a multitude of Buffalo sites have served as the locus for temporary artistic expressions and controlled insanity: the Broadway Market, abandoned factories, warehouses, auto showrooms, roller rinks, deserted downtown malls and department stores, the Tri-Main Center, and the Buffalo Convention Center. This year’s event—officially, the 22nd version of Artist &Models. Advance tickets are available at Hallwalls -Talking Leaves Books (both Elmwood & Main St.), Sweetness 7 Cafe (Lafayette & Grant), Rust Belt Books (Allen St.), Room (Hertel) and Clarence Coffee Center (Goodrich Road). This weekend in Buffalo, everyone is Irish. It’s parade time and, boy, I DO LOVE A PARADE! 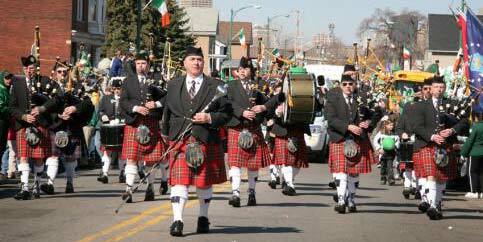 And Buffalo celebrates St. Patrick’s Day with not one, but two, parades this weekend! Here is some information on both of them. Saturday, March 13 at noon: The Valley Community Association’s 17th Annual “Old Neighborhood” St. Patrick’s Day Parade will kick-off at the Valley Community Center, located near the junction of South Park Avenue and Elk Street. This parade retraces the original 1913 parade route, winding through Buffalo’s historic Valley and Old First Ward neighborhoods. This year, the crowds along South Park Avenue, Smith Street, Elk Street, Hamburg Street, and O’Connell Avenue can expect the biggest “Old Neighborhood” parade yet, topping last year’s count of 60 contingents. There will be something for everyone – Irish dancers, marching bands, floats, clowns, classic cars, radio stations, police and fire department vehicles, unions, dignitaries, family clans, and more. Following the parade, there will be a grand Irish “Hooley” at the Valley Center that will feature both inside and outside bars, live Irish music by “Blackthorn,” Irish dancers, and plenty of food and refreshments. Sunday, March 14 at 2 p.m.: The larger of the two parades takes place on Sunday and runs up Delaware Avenue from Buffalo’s art deco City Hall. Each year, thousands of people flock downtown to carry on a Buffalo tradition. Leading up to 2 p.m., excitement and anticipation fill the air, as enthusiastic crowds await the signal of the Grand Marshal. Then a roar goes up, as bagpipers, local dignitaries, Irish dancers, high school marching bands, Civil War reenactment groups, fire trucks, Irish-American philanthropic organizations, and many others march proudly by. With Irish tricolor flags lining the parade route and children and adults sitting in lawn chairs along the curb, it’s a fun, colorful scene. I’ll be on the Taste of Buffalo presented by Tops float, so if you see me, give a Shout Out! I hop you go out and celebrate this wonderful time of year! After the parades, I always like to go and eat some corned beef and cabbage. Please share your comments on who has the best corned beef in town! Buffalo has festivals and events almost all year long – except for that stretch between New Year’s and St. Patrick’s Day. Now we have two events to fill in that gap and celebrate our winter weather – the Labatt Blue Pond Hockey Tournament and the Buffalo Powder Keg Festival. The Labatt Blue Pond Hockey Tournament started three years ago as a one day event of 16 teams competing on Lake Erie. Now in its third year, the tournament has expanded into a two-day event of 112 teams competing on eight different rinks. This year also marks the first ever Buffalo Powder Keg Festival. For those who are interested in additional winter activities besides hockey, the Buffalo Powder Keg Festival offers a variety of winter-themed events; there will even be a Seneca Street exit ramp tubing hill! The Powder Keg festival will take place from the One HSBC Tower Plaza to the Erie Basin Marina, where the Pond Hockey tournament will be located. Activities include kan-jam, broomball, bubble hockey, snowman-building competitions, Guinness Book Ice Maze, two ice-skating rinks, Pearl Street beer tent with live music, Kid’s tent, and many more! Both events take place February 27th-28th and are free, but some activities do require purchase or registration. Make sure you come out and take advantage of these winter activities before spring gets here!